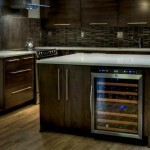 When it comes to integrated refrigerators, there’s a lot of room for expression and customization. 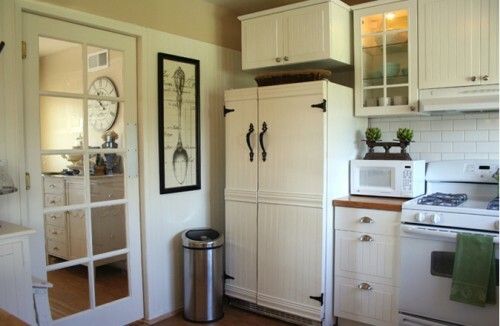 Here are some interesting examples of ways you can tie your refrigerator into the rest of the kitchen’s decor. Most of these appliances have basically one of a kind custom panels made from expensive materials and with intricate hardware. The Old Painted Cottage gives a great example of a DIY project with molding. She actually applied this treatment to an older fridge that probably didn’t look that great but worked just fine. 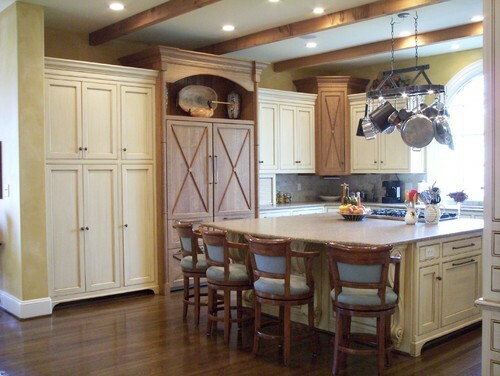 The hinges are my favorite part and the beadboard details match the cabinets this way. 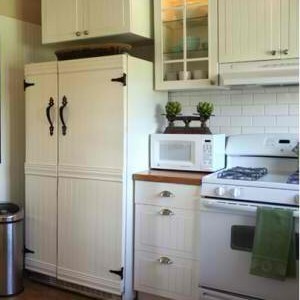 Pay attention to small details, like having a white fridge vent on bottom when attempting to DIY this project. Usually it’s recommended that you use a fridge that is meant for custom panels, but if you are just going to get rid of it anyways a DIY project may be in order. 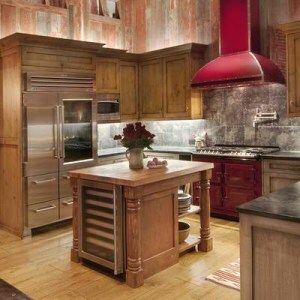 Finding appliances that match a shabby chic or cottage kitchen are the most difficult to track down. This will be one of the cheapest of all of the projects as it maintains a simple shape. 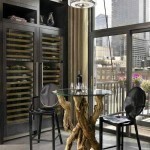 The weathered finish would be too much on all of the cabinets but helps the fridge to look like an aged armoire. With some custom panel fridges like the PSB48YGXSV you will still see trim or a water dispenser so it’s better suited for a more modern application. You will need more of a seamless appliance style for this look. There isn’t a lot of information on the actual fridge used here. The only information is that it’s a Sub-Zero with freezer drawers on bottom. The panels here have a farmhouse feel to them, and the faux legs or columns on the fridge surround help it to look more like furniture. The elevated height also contributes to this. The x style pattern can be very elegant. 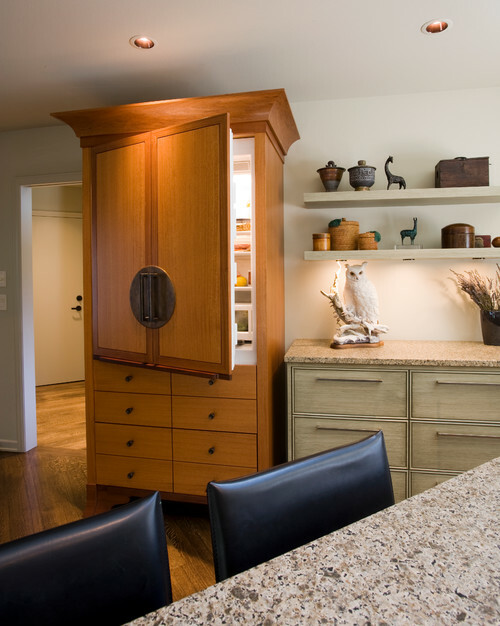 You could have a cabinetmaker use a wider style of molding to mimic barn doors. 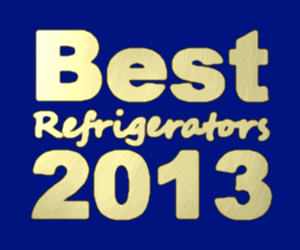 That is a really hot design trend in 2013. Contemporary Kitchen by Salem Design-build Kaufman Homes, Inc. 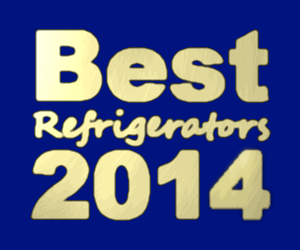 So far all of the fridges have had more of French or antique armoire feel to them. 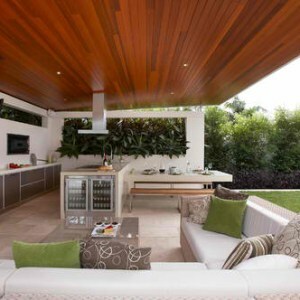 Kaufman Homes dared to try a more contemporary influence. Plus, this isn’t a built-in like most of the others. 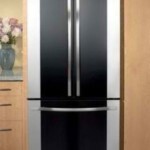 It may also look like a French door style but it’s just a top fridge style. I love the proportions of the molding on top. 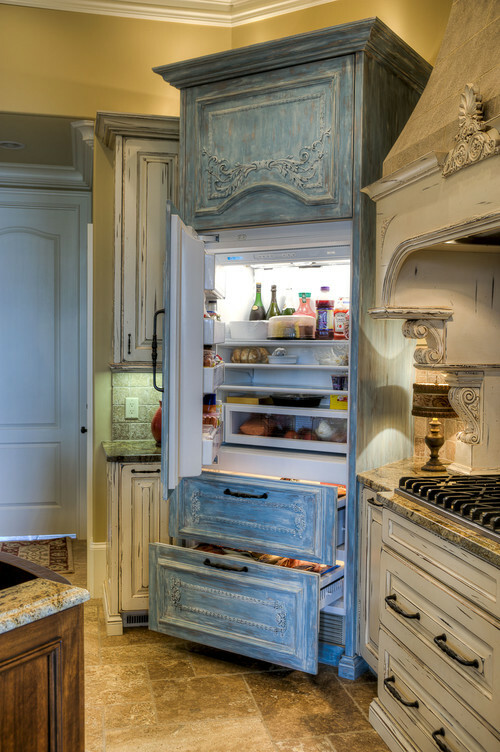 Your refrigerator is one of the focal points in your kitchen, so making it look like an antique can be well worth the cost and effort!